Yes, there is futebol even on this blog! Read Jan van den Berg‘s second post, and let us have your comments, for all languages! Today, 12 June 2014 – the start of the World Cup. An exciting time for many. A time when most people are stuck behind their TV screens watching some twenty men fighting for their nation’s glory. Arguably, this is reason enough to stay at home and watch football this summer. Moreover, even people who normally abstain from watching football are all dressed up in horrible chauvinistic outfits screaming their lungs out. In other words, a fun time for all. However, there is one group of people who, quite possibly, are not looking forward to the World Cup in Brazil, namely language purists. Why? Because during the World Cup both football players and ex-football players are given a platform to express themselves not only physically, but also verbally. Therefore, I would advise you to listen to some of the interviews football players give before or after a match and take a piece of paper and note down any grammatical or other linguistic howlers. Chances are you’ll run out of ink. In the Netherlands we’ve got one particular former football player who, besides being considered one of the football greats of all time, is famous for his incorrect use of Dutch. This is Johan Cruijff (born 1947). One of his famous expressions is: Je moet altijd zorgen dat je een doelpunt meer scoort als de tegenstander (“always make sure you score one goal more than your opponent”). In this instance we find that Cruijff mistakenly uses the conjunction als, whilst he should be using the conjunction dan. 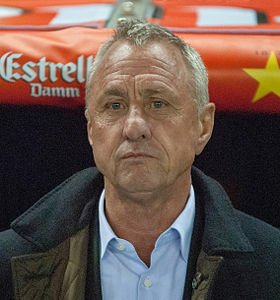 However, this is just one instance where Cruyff messes up. In Dutch there is even a word to label his bad use of Dutch, termed, Cruyffiaans (“Cruyffian”). Naturally, Cruyff is not the only one. Thus, it seems that while football players often walk the walk, they often are unable to talk the talk. Consequently, language purists, you have got a tough summer ahead of you. The World Cup is coming. This entry was posted in MA Leiden, news, usage features and tagged Cruijff, futebol, groter als, World Cup. Bookmark the permalink.